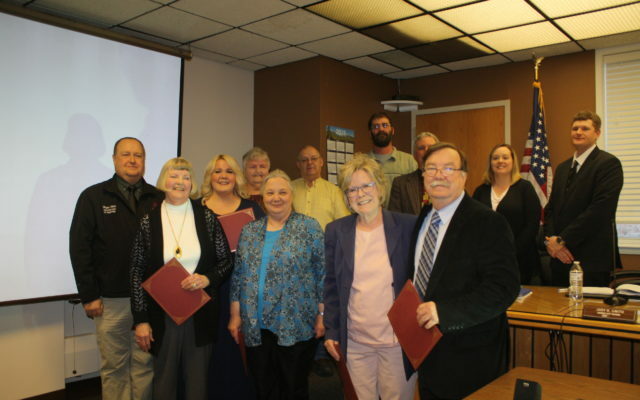 Members of the Caribou City Council recently honored numerous volunteers for their service to the city as well as high school choral students and writers who have won state and local competitions. 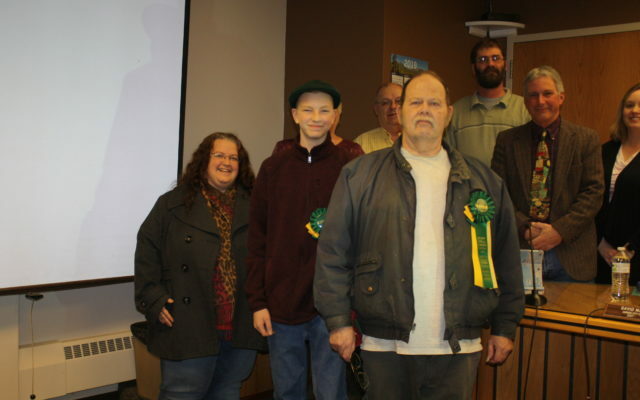 CARIBOU, Maine — Members of the Caribou City Council recently honored numerous volunteers for their service to the city as well as high school choral students and writers who have won state and local competitions. Councilors presented Spirit of American certificates to Barbara Aiken, Bill Flagg, Roger Felix, Christina Kane-Gibson, Connie Michaud, Valerie Waldemarson, Shawn Pelletier, Channel X Radio and the Caribou Rotary Club. Councilor Joan Theriault said that Aiken is a longtime volunteer of the Caribou Ecumenical Food Pantry, contributes home-baked food to the Cary Medical Center Ladies Auxiliary and sews pillows that the auxiliary gives to patients in recovery. She also is a leading organizer of the annual gingerbread decorating event at the Caribou Wellness and Recreation Center. 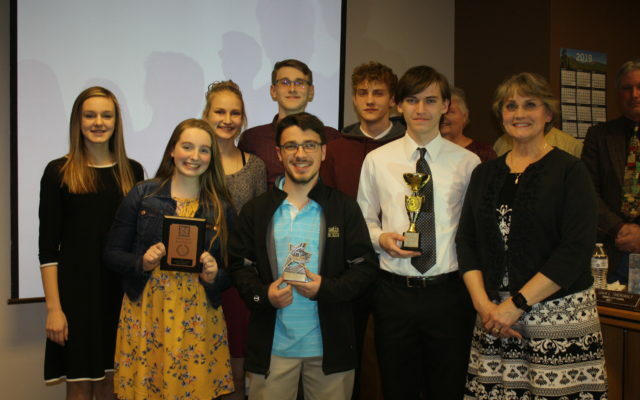 On April 8, Caribou councilors honored members of the Caribou High School Show Choir for their award-winning performance at the Maine State Vocal Jazz Festival held on March 30 in Fairfield. Standing in the back row, from left, are Mia Theriault, Afton Marker, Christoper Parent and Isaac Marker. In front, from left, are Naomi Cote, Austin LaPlante, Michael Kashian and choir co-director Vicki King. “Barbara and her band of volunteers assemble 250 houses for children to decorate. It takes nearly a week to build the houses and portion out the candy. The tradition has continued for more than 20 years,” Theriault said. Theriault continued by honoring Bill Flagg, director of community relations and development at Cary Medical Center, and the Caribou Rotary Club. Flagg has played a role in having the AARP of Maine certify Caribou as an age friendly community and in establishing Recovery Aroostook. He also advocates for Maine veterans and helped raise funds to open a women’s sober house in Caribou. The Rotary Club has supported and raised funds for organizations such as the Bread of Life Soup Kitchen, Caribou Performing Arts Center, the high school ski program and the veteran’s memorial. The council also honored Caribou city employees Christina Kane-Gibson and Connie Michaud. Kane-Gibson is the marketing and events coordinator and has helped support events such as Caribou Daze, the Caribou Marathon, Halloween Festival and Gingerbread Festival and in 2018 helped create the downtown alliance group to revitalize the downtown business area. Michaud recently retired after 33 years serving the city office, first as the motor vehicle officer, then as assistant clerk. Other honorees included: Channel X Radio — founded by the late Dennis Curley 33 years ago — for delivering “locally owned and operated” services to the community; Roger Felix, business and community liaison at Loring Job Corps, for his volunteerism with the Caribou VFW and Maine Veterans Cemetery; and Shawn Pelletier, a member of Caribou Senior Living, LLC., and founder of Brian’s Ride, a fund created in memory of Brian Caldwell, formerly of Limestone, who passed away from cancer in 2014 at age 53. Hope Shafer, director of the Caribou Public Library, left, and Caribou city councilors honored winners of the library’s recent limerick contest during the April 8 council meeting. Pictured are contest winners Larry Bubar, front right, and Conner Albers, front center. Absent from the photo is elementary category winner Roy Cyr. Waldemarson, adviser for Caribou High School’s Jobs for Maine Graduates and National Honor Society, was presented an award for her recruitment of student volunteers for numerous local events such as the Caribou Marathon, Arts & Crafts Fair, Santa’s Workshop, Holiday Shoppe for Children, and Halloween at the Caribou Wellness and Recreation Center. She and students have donated to local food pantries, created a Community Cupboard project, raised funds to send local children to camp, and assisted with business forums and job fairs. Senior Austin LaPlante received an outstanding musicianship award for his solo performance, and the jazz choir students, directed by King and Vaughan McLaughlin, took home a bronze award in their category. Hope Shafer, director of the Caribou Public Library, was on hand to honor winners of the library’s 2nd annual limerick contest held on March 19. The event celebrated Irish music and poetry and featured 16 participants from age 5 to adult. Roy Cyr won the elementary level while Connor Albers won the 6th to 12th grade category and Larry Bubar was the adult winner. Later on Monday evening, councilors approved the library using a $9,771 donation from the estate of Phillip Turner to establish the Phillip Turner Library Memorial Fund. That fund will be used to buy books, pay for programming, and purchase related materials. Turner, who passed away in 2018, was a local author who wrote many historical novels and plays.